Say “Cheese”! 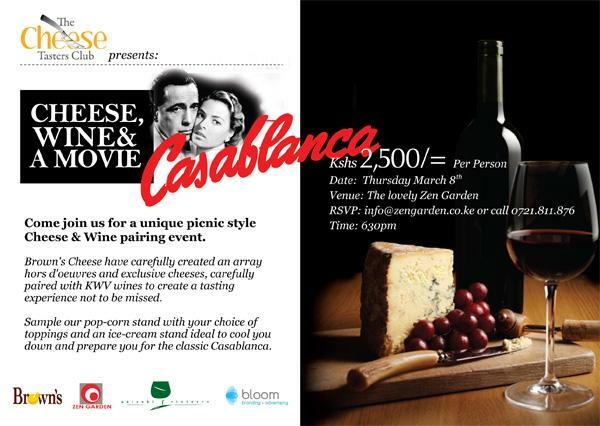 The Cheese Tasters Club host ‘Cheese, Wine and a Movie”! I have loved ‘Casablanca’ since I was a little kid and had somewhat of a weird crush on Humphrey Bogart. I mean what better way to spend a Thursday evening than with a glass of KWV wine, some amazing Brown’s Cheese canapés, and the classic movie Casablanca. Sounds perfect to you? Then show up to the Cheese Tasters Club- who present a tasting event just for you! Fancy some pop-corn during the movie? They have that covered too with pop-corn AND ice-cream stands filled with different toppings to tickle your taste buds. Join them on Thursday March 8th @ 6:30pm for a romantic event not to be missed! Venue: The great outdoors at the serene Zen Garden.